Having had some delay due to a web server upgrade, we were unable, until now, to post a photo here that I received, thanks to Christian Wolff. Some of you may have seen this on the EMC Facebook page (https://www.facebook.com/emcsystems/, which is a good source for immediate things of interest), but I wished to place the picture here, where it will have a more permanent place to live. 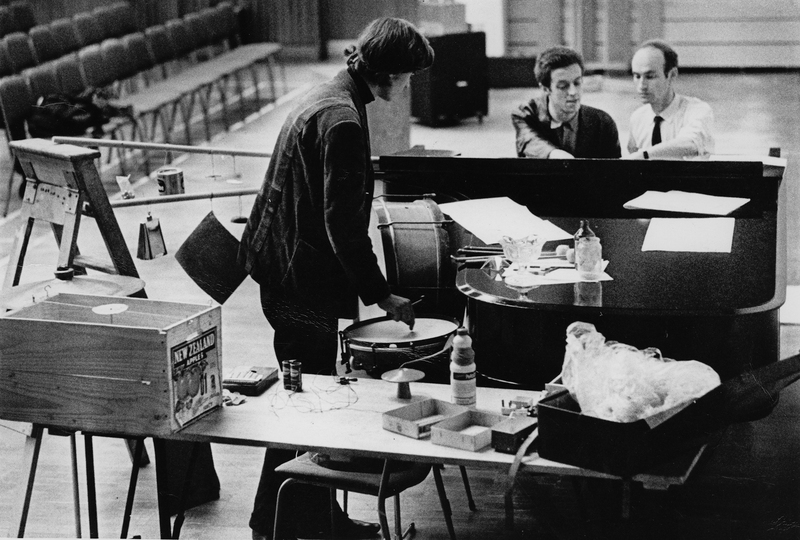 Here is (l-r) Christopher Hobbs, Cornelius Cardew, and Christian Wolff rehearsing Trio II for Sounds of Discovery, at the International Students House, London, 22 May 1968. This four-day concert series occurred when Christian Wolff was resident in London, about the time he was working on his Prose Pieces and, coincidentally, Cardew was creating the first Paragraph of his massive work, The Great Learning. This concert was just under a year before the Music Now Festival at the Roundhouse, London, which would see the premiere of Paragraph 2, as well as provide the basis for the Scratch Orchestra. Some of the materials in the foreground are there for another piece. The four-day event also included the British premiere of Terry Riley’s In C, directed by Hobbs. Hobbs was, at the time, just 17, and a student of Cardew’s at the Royal Academy of Music, but Cardew brought Hobbs into the scene as an equal participant. I was absolutely thrilled to find that Christian Wolff had this photo, and for the Dartmouth University Library to provide a copy (it is part of a current exhibition on Wolff). In these days of digital snapshots, it is easy to forget how infrequently we documented our lives on film, due to the expense (especially indoor shots, which then required flashbulbs or fancy film stock). I will add more to the context of this photo in due course, but I thought it worth showing. Christopher Hobbs, Cornelius Cardew, CW, London, International Students Center, 1968. Preparing for concert. Next Next post: News from Ghent….